Diálogos is Ballet Hispánico's conversation series exploring the interconnections of the arts, social justice, and Latino cultures. 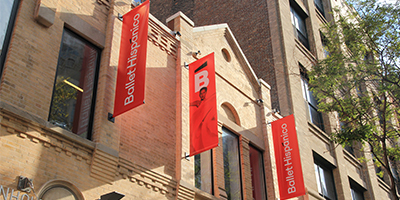 Ballet Hispánico’s home is an interdisciplinary cultural and community resource made possible by Honorary Chair Jody Gottfried Arnhold and the Arnhold family. Through panels, forums, exhibitions and other public programming, the Arnhold Center will further an awareness of Latino art forms as a tool for social and cultural acceptance and as a powerful agent for dialogue about race, equity and access. Ballet Hispánico partnered with Brooklyn Dance Festival, founded by Tamia Santana, and Maria Torres Emerging Artists Foundation, founded by Maria Torres, John O’Connor, and award-winning actress Vanessa Williams, to create the evening’s panel featuring influential Latina women across the arts. The discussion, the first in the series Women of Color in the Arts, explored our panelists’ accomplishments, the challenges they have faced, available resources, and ways to bring more women of color into arts leadership positions. Women networking with a purpose. The evening’s conversation was moderated by Tamia Santana, Founder and Director - Brooklyn Dance Festival, and featured the following panelists: Former New York State Senator Marisol Alcántara; Ayodele Casel, Actress, Tap Dancer, Choreographer; Maria Torres, Director, Choreographer, Producer; Lauren Argentina Zelaya, Assistant Curator, Public Programs – Brooklyn Museum. With roots that derive from Arabic to African, Indian, and Spanish influences, flamenco dance and its unique interplay of music, dance, and song have captivated audiences across continents for generations. This second installment of Ballet Hispánico’s Diálogos series unpacked the cross-cultural influences that have established flamenco as a form, while exploring how its folkloric roots have been recast in contemporary ways. Belgo-Colombian choreographer Annabelle Lopez Ochoa—who has set two flamenco-inspired works on the Ballet Hispánico Company—joined acclaimed flamenco masters Liliana Morales and Nelida Tirado to discuss the impact of this magnetic dance form on their identities. The panel event included an exclusive sneak preview of Lopez Ochoa’s new work for Ballet Hispánico, Línea Recta. The inaugural event of Ballet Hispánico’s new Diálogos series explored the racial and cultural impact of the Cuban ballet methodology on its home country and throughout the world. Panelists discussed the distinguishing characteristics of the Cuban methodology, nuances in how it’s practiced within and outside of Cuba, and the opportunities it has created for artists in an art form that is commonly perceived to be homogeneous. Ballet Hispánico 2018-19 from Ballet Hispanico on Vimeo.